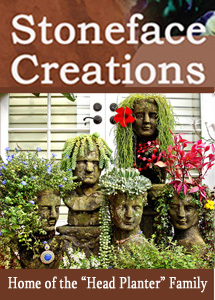 Container Gardening with KatG cubit: Article: If the shoe fits, fill it with flowers...: Thank-you. Article: If the shoe fits, fill it with flowers...: Thank-you. I got goosebumps reading your beautiful article Sharon. I wish I had of had the opportunity to have met Carol on Dave's Garden, but you have so captured her spirit here! I am very honored that you would share this beautiful story with me. It's just a thank you for giving us such a lovely Cubit to enjoy. I agree.Thank you so much for sharing Carol's Garden with us. I would love to have known her. You would have loved her. She was one of a kind, and I guess I'll miss her forever. Here's the chair she built and attached it to the tree. Forgot to mention that was one of her 'bonsai' trees. Look at the base of the trunk. Here's another one. What an wonderful article Sharon. You certainly managed to capture the spirit that was Carol. Yes, Ava, she did your sister proud!!! Thanks. It would have been even better if I'd had a couple of those big round rocks y'all grow in Texas! Probably....she always did laugh at some of my ill conceived notions! See now, a lot of this stuff is new to me. You never mentioned the "bonsai" trees before, so you just keep on writing, Shar! That was a lovely piece. Not sure why I never mentioned the bonsai trees earlier...there was so much to see and do I had to wait for that memory to resurface. But Katg's container cubit stirred up my memories of Carol's old shoes, and one thing led to another....one photo led to another...and there were the bonsai trees. I wasn't a part of the thread and didn't know Carol. What a wonderful tribute to her memory. I really enjoyed this article Sharon. You would have enjoyed her, too. Thank you again, Shar, for building that beautiful garden for my sister and all of our lost friends and loved ones. So many friends and family gone now, but I'll bet they are happy here in Carol's little Eden. Sharon, wonderful article ! You're such a great friend to do something so wonderful for Carol's memory! I was also impressed by the bonsai, amazing! And loved the containers...such creativity. Thanks for sharing that with us! What a great article!! Did you sleep at all in Alaska? LOL? Hard to sleep when its not dark! How did you know, Anjl. I hardly slept, and then finally the night after the memorial service I slept so late Ava came to check to see if I was OK. It really was different, that's for sure. This is as dark as it ever got, and this dark only for a short time. Amazing.